Who owns the Reliance brand? What comes to your mind first when you hear the word Reliance? Is it Reliance Industries or Reliance Communications? ADA group or Mukesh group? As part of the family settlement both the brothers Mukesh and Anil Ambani have the right to use the brand name Reliance. But who uses the brand well to their advantage? I searched Google to find out the answers. 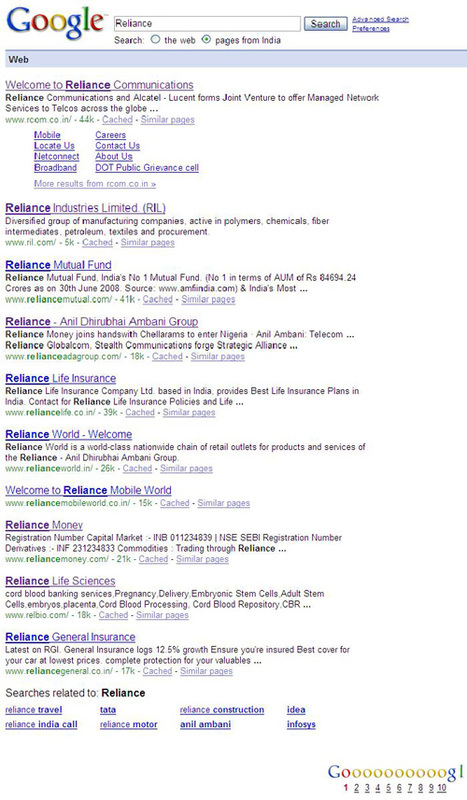 Google search for the word Reliance returns Reliance Communications website as the first result. Yes India’s largest private sector enterprise Reliance Industries was pushed to second place by a relatively newcomer Rcom. Also in the ten results shown in the first page, eight belonged to ADAG group. Apart from Reliance Industries, Reliance Life Sciences is the only business that belonged to Mukesh Ambani got listed in the first page. Interestingly, India’s retail giant Reliance Retail found no place in the top 10 list. Wake up to the internet world, Mukeshji. There is more than what meets the eye. I guess ADAG has done thier search engine optimization for thier sites better then the elder brother. Apart from that, there are many more techniques to make your site appear at the top. It might not be just popularity. That’s exactly what I’m saying too. Anil is taking steps, Mukesh needs to wake up to the internet world.